Democratic Rep. Tim Walz has won a three-way primary for Minnesota governor. Walz leveraged his rural Minnesota connections and a geographically balanced ticket to defeat state Rep. Erin Murphy and Attorney General Lori Swanson in Tuesday's primary. Walz is leaving Congress after six terms representing southwestern Minnesota. 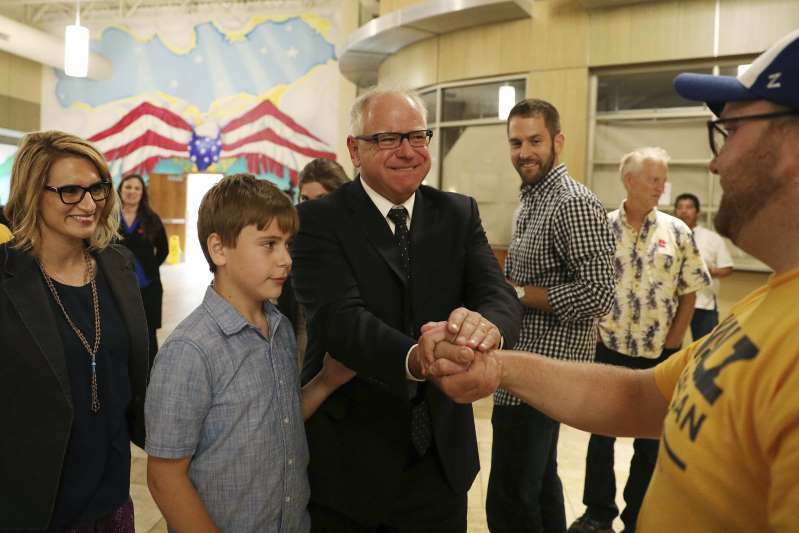 Walz's outstate appeal and pedigree as a former teacher and a National Guard veteran had long made him a favorite among Democrats trying to hang on to the office as two-term Gov. Mark Dayton retires. But he lost the party's endorsement in June to Murphy and shook up his campaign soon afterward. [post_ads]County Commissioner Jeff Johnson has beaten former Gov. Tim Pawlenty in Minnesota's Republican primary for governor, derailing Pawlenty's bid to reclaim his old job. Johnson won Tuesday despite Pawlenty's enormous fundraising and name recognition advantages. He also won despite his own history as the party's losing candidate for governor four years ago. Johnson positioned himself as a more conservative candidate than Pawlenty. He branded the former two-term governor as part of the "status quo" and bashed him for calling Trump "unhinged and unfit for the presidency" in the weeks leading up to the 2016 election. Madison businessman and political newcomer Bob Stefanowski has won the Republican primary for Connecticut governor, defeating four fellow GOP contenders. The 56-year-old former General Electric executive promoted his ability to turn around struggling companies and dubbed himself "Bob the Rebuilder" in his campaign advertisements. Stefanowski was the second-biggest spender in the campaign primary, trailing only former Greenwich hedge fund manager David Stemerman. Stemerman and former Trumbull First Selectman Tim Herbst questioned Stefanowski's Republican pedigree, noting he became a Democrat only to switch back to the GOP shortly before announcing his candidacy for governor. Stefanowski was the first to launch a major TV ad campaign in the race. He has called for eliminating the personal income tax. Democratic Gov. Dannel P. Malloy is not seeking a third term. A Wisconsin state senator and close ally to Gov. Scott Walker has defeated a former Marine who cast himself as a political outsider in the state's Republican primary for U.S. Senate. Former Meriden Mayor Manny Santos has won the Republican nomination for the U.S. House seat being vacated by Connecticut Rep. Elizabeth Esty of Connecticut, who came under fire for her handling of a sexual harassment case in her office. The party's endorsed candidate defeated two GOP rivals — Ruby Corby O'Neill of Southbury and Rich Dupont of Watertown — in Tuesday's primary. Santos has called President Donald Trump's economic policies "dead on" and has vowed to fight tax increases and unnecessary spending. He comes into the general election at a significant financial disadvantage. Recent reports show he has less than $500 in cash still on hand for the race. Esty, a Democrat, abruptly announced in April she would not seek a fourth term. She apologized for not protecting her employees. Pete Stauber has won the GOP primary for the northeastern Minnesota congressional seat being vacated by Democrat Rick Nolan. Stauber, a St. Louis County Commissioner and retired Duluth police officer, defeated former Duluth School Board member Harry Robb Welty on Tuesday to advance to a general election contest that's seen as one of the Republicans' best chances anywhere in the country of picking up a House seat now held by a Democrat. The 8th District was once a Democratic stronghold but has evolved into a swing district. Stauber's campaign got a boost from visits in June by President Donald Trump and last week by Vice President Mike Pence. Trump carried the district by 15 percentage points in 2016. U.S. Rep. Keith Ellison has won Minnesota's Democratic primary for attorney general. Ellison defeated four other candidates to win Tuesday's primary days after a former girlfriend accused him of domestic abuse. Ellison denied the allegation. Ellison decided to give up his safe Minneapolis-area seat to try for attorney general when incumbent Lori Swanson ran for governor. He said it was a chance to make a difference in pushing back against some of President Donald Trump's policies that he says are hurting people. In 2006, Ellison became the first Muslim elected to Congress. He is also vice chairman of the Democratic National Committee. Republicans haven't held the Minnesota attorney general seat for more than half a century. Randy Bryce, a union ironworker known as "Iron Stache," has won the Democratic primary in the race to replace retiring House Speaker Paul Ryan. Bryce defeated Janesville schoolteacher Cathy Myers in Tuesday's primary. Former Ryan aide Bryan Steil (STY'-uhl) was the Republican front-runner, facing token opposition in the primary. Bryce captured national attention with a slick announcement video last year, before Ryan announced his retirement. He's raised more than $6 million, six times what Myers brought in. He won endorsements from Vermont Sen. Bernie Sanders and labor activist Dolores Huerta. Democrats are optimistic for their chances to pick up the southeast Wisconsin district that Ryan has represented for 20 years. But opponents argue that Bryce's past, which includes failing to pay child support and a 20-year-old drunken-driving arrest, makes him unreliable and unelectable. Jennifer Zielinski has won a three-way Republican primary for the Minnesota seat in Congress being vacated by Democrat Keith Ellison. The 35-year-old Zielinski had the GOP endorsement over two little-known rivals. She is a business services worker for Allina Health who hasn't held elected office before. The Minneapolis-area seat is so reliably liberal that a Republican hasn't held it since 1960. She will face Minnesota state Rep. Ilhan Omar, the nation's first Somali-American legislator. She won the Democratic primary Tuesday. Ellison was leaving the seat to run for state attorney general. Wisconsin state schools chief Tony Evers has won the Democratic primary for governor and will face Republican Gov. Scott Walker in November. Evers emerged from a field of eight candidates in Tuesday's primary. He was the only candidate to have won election statewide before and now faces his biggest challenge against Walker. Walker has built up a big financial advantage for his re-election bid. He's already run more than a dozen television ads touting his record of the past eight years. The 66-year-old Evers has been the state's education chief since 2009 and has clashed with Walker in the past on mostly education issues. Walker's campaign and Republicans criticized Evers for not revoking the license of a teacher who was caught viewing pornographic emails on his school computer. Minnesota state Rep. Ilhan Omar, the nation's first Somali-American legislator, has won a crowded Democratic primary to replace Rep. Keith Ellison in Congress. Omar's victory Tuesday all but ensures she'll set another historic mark as the first Somali-American in Congress. Minnesota's 5th Congressional District includes Minneapolis and surrounding suburbs that tilt heavily Democratic. Omar positioned herself as the best-equipped to counter President Donald Trump's administration. She rose to national prominence after winning her legislative seat in 2016. The first-term lawmaker defeated former state House Speaker Margaret Anderson Kelliher (KEL'-uh-hur), state Sen. Patricia Torres Ray and others. Ellison triggered a scramble for the seat when he filed a last-minute run for Minnesota attorney general. A former aide to House Speaker Paul Ryan has won the Wisconsin Republican primary race to replace him. Bryan Steil (STY'-uhl) won Tuesday over five other competitors. Steil far outraised his opponents and secured the backing of prominent donors and Republicans, including Ryan. He will face either Randy Bryce or Cathy Myers in November. Steil is general counsel for Charter NEX Films Inc., an independent producer of polyethylene film used for food and consumer packaging. He previously worked eight years as a corporate attorney at electric motor manufacturer Regal Beloit Corporation. He is from Janesville, the same hometown as Ryan, in southeast Wisconsin, not far from the Illinois border. The congressional district leans Republican. Minnesota state Sen. Karin Housley has easily won the state's Republican primary in a race to finish the last two years of Al Franken's Senate term. Housley faced no major challengers when launching her campaign in the days after Franken announced his resignation over allegations of sexual misconduct. His departure unexpectedly put a Democrat-held seat in play, complicating the party's hopes of retaking the Senate. But Minnesota hasn't yet appeared as a top pick-up target for Republican groups. Sen. Tina Smith was appointed by Gov. Mark Dayton to replace Franken in January. She won Tuesday's Democratic primary for the seat. [post_ads]A celebrated teacher has defeated the party-endorsed candidate in the Democratic primary for a Connecticut U.S. House seat being vacated by Rep. Elizabeth Esty, who acknowledged mishandling sexual harassment complaints in her Washington, D.C., office. In Tuesday's primary, 2016 National Teacher of the Year Jahana Hayes bested former Simsbury First Selectman Mary Glassman. If elected in November, Hayes would become the first black woman elected to Congress from Connecticut. The 45-year-old educator from Wolcott has attracted significant out-of-state political contributions and endorsements from unions and liberal organizations. She says there's an "appetite for change" among voters. Recent campaign finance reports show Hayes leading Glassman and all three Republican candidates in fundraising. Esty abruptly announced in April she would not seek a fourth term. She apologized for not protecting her employees. Sen. Tina Smith has won Minnesota's Democratic primary to finish the final two years of former Sen. Al Franken's term. Smith took her spot in the Senate in January after Franken resigned amid sexual misconduct allegations. She was the state's lieutenant governor before Democratic Gov. Mark Dayton appointed her to the seat. She defeated several Democrats to clinch the party's nomination, including Richard Painter, the former GOP ethics attorney whose profile rose as a strident critic of President Donald Trump. Smith is a longtime political operative in Minnesota. Minnesota state Rep. Jim Newberger has won the GOP primary to take on incumbent Democratic U.S. Sen. Amy Klobuchar (KLOH'-buh-shar). Newberger beat three other candidates Tuesday but faces an uphill battle in November against the popular Klobuchar, who is seeking a third term in the Senate. Klobuchar won her first two terms by at least 20 percentage points and has been mentioned as a possible presidential candidate in 2020. Newberger, a paramedic from Becker, has served three terms in the Minnesota House. Wisconsin Republican Gov. Scott Walker has dispensed with a nominal GOP challenger as he awaits the winner of a crowded Democratic primary. Walker is seeking a third term in office after a failed 2016 presidential run. Eight Democrats were seeking to challenge him in November. Walker handily defeated his token opposition, Robert Meyer, who was not actively campaigning. Walker has amassed nearly $5 million and has already run more than a dozen television ads as he positions himself for the fall election. Democrats are optimistic that this year presents their best chance ever to take down Walker. They've scored unexpected election victories in other races this year and polls generally show Republicans to be vulnerable. In 2012, Walker became the first governor to ever defeat a recall election. Sen. Amy Klobuchar (KLOH'-buh-shar) of Minnesota has easily won a Democratic primary as she seeks her third term. In a year marked by high-profile lawmakers losing primary challenges, Klobuchar had no serious opposition Tuesday. Klobuchar is one of Minnesota's most popular politicians, winning her first two terms by at least 20 percentage points. She has been mentioned as a possible presidential candidate in 2020. A former utility executive from Vermont has become the first transgender candidate to win a major political party's nomination for governor. Christine Hallquist defeated three other Democrats en route to victory in Tuesday's primary. The former CEO of the Vermont Electric Cooperative says she's running because she feels she has the best plan to help Vermont residents get higher-paying jobs, provide health care for their families and better educate their children. Hallquist is being supported by The Victory Fund, a political action committee that backs LGBTQ candidates across the country. The committed labeled her a "game changer." Vermont's Republican Gov. Phil Scott has won his party's nomination to run for a second term as the state's top executive. Democratic Wisconsin Sen. Tammy Baldwin is advancing to the November general election after facing no opposition from her own party. She faces a tough re-election bid against one of two loyalists to President Donald Trump who are seeking to run against her. Baldwin is the only Democrat in a statewide office of importance in Wisconsin, and outside groups have already spent millions on television ads attacking her. Baldwin's campaign has played up her work on moderate and core Wisconsin issues, including her buy-America plan that Trump supports and her work with Republican Sen. John McCain on lowering drug costs. The Republicans battling to run against her are political outsider Kevin Nicholson and state Sen. Leah Vukmir. Polls show their race to be very close. Polls have closed for primary elections in Minnesota and Wisconsin. Polling places across the two states shut their doors at 9 p.m. Eastern on Tuesday. Local election officials are now counting the votes. Results will trickle in over the coming hours. Primaries in both states included races for governor and Senate, and both Senate seats were on Minnesota's ballot because of a special election to finish Al Franken's term. Key House races included the Wisconsin primary for the seat that currently belongs to House Speaker Paul Ryan and a Minnesota seat being vacated by Democrat Keith Ellison, the first Muslim to serve in Congress. Ellison is running for state attorney general amid domestic abuse allegations from an ex-girlfriend. He denies them. Small-business owner Matthew Corey has won the Republican nomination for U.S. Senate in Connecticut and will face an uphill battle against Democratic U.S. Sen. Chris Murphy. In Tuesday's primary the Manchester Republican defeated Dominic Rapini, a national accounts manager for Apple computers. Corey is a U.S. Navy veteran and owner of a Hartford pub and a window-washing business. He earlier unsuccessfully challenged Democratic U.S. Rep. John Larson. Corey has called for more investment in small businesses in low-income communities. He's also supportive of apprenticeship programs, corporate tax reform and a tax credit for home school parents. As of July 25, records show Corey had raised about $31,000 in campaign funds compared with nearly $13.5 million for Murphy. There was no primary on the Democratic side. Businessman Ned Lamont has won the Democratic nomination for Connecticut governor, defeating Bridgeport mayor and ex-convict Joe Ganim. Lamont's victory comes 12 years after he defeated U.S. Sen. Joe Lieberman in a Democratic showdown, only to lose the general election when Lieberman ran as an independent. That race was seen as part of a national referendum on the Iraq War. Lamont has said he'll "save Connecticut" from President Donald Trump's policies, whether it's the weakening of environmental standards or abortion access. Lamont says he'll bring a businessman's approach to solving the state's fiscal woes. He supports unions and a higher minimum wage. Ganim was elected Bridgeport mayor in 2015 despite serving seven years in prison for public corruption. Democratic Gov. Dannel P. Malloy decided against running for a third term.